Posted on May 2, 2006 by Chad O.
PC Perspective has put together an in-depth review of the ASUS W5F, a very popular ultraportable notebook. 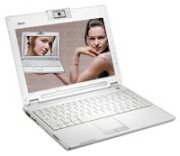 This is the Intel Core Duo-powered sequel to the W5A, and going by links/pageviews, the W5F has been the most popular laptop here at Small-Laptops.com. In addition to the Core Duo CPU, it’s got a 12.1-inch widescreen display and a built-in optical drive, as well as a built-in 1.3MP camera. As far as an ultra-portable laptop goes, the Asus W5F has everything and then some — an integrated camera, a bonus Blue Tooth mouse, and even digital audio output. The only shortcoming that Jonathan noted was the W5F having only one memory slot. Thanks to Ken for e-mailing this to me. This entry was posted in ASUS, Reviews. Bookmark the permalink.